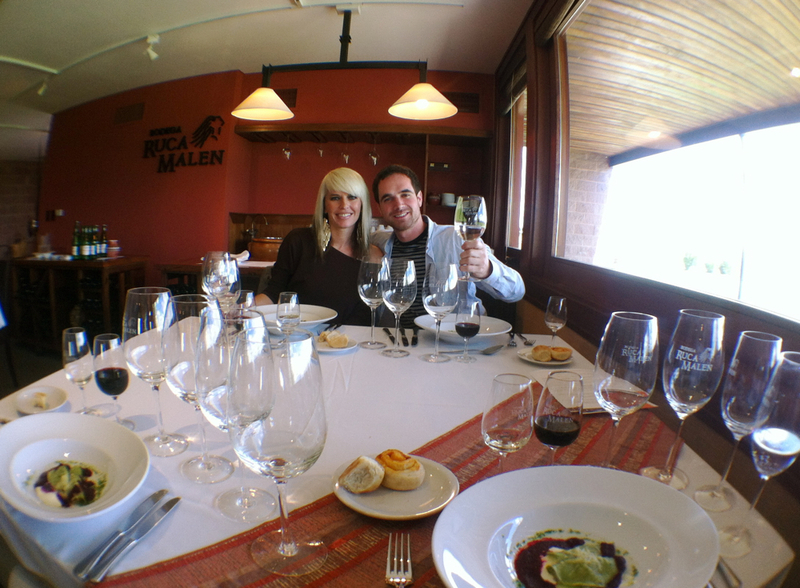 Nothing is more rugged than the vast lands of western Argentina, and nothing is more satisfying than its wine and food. 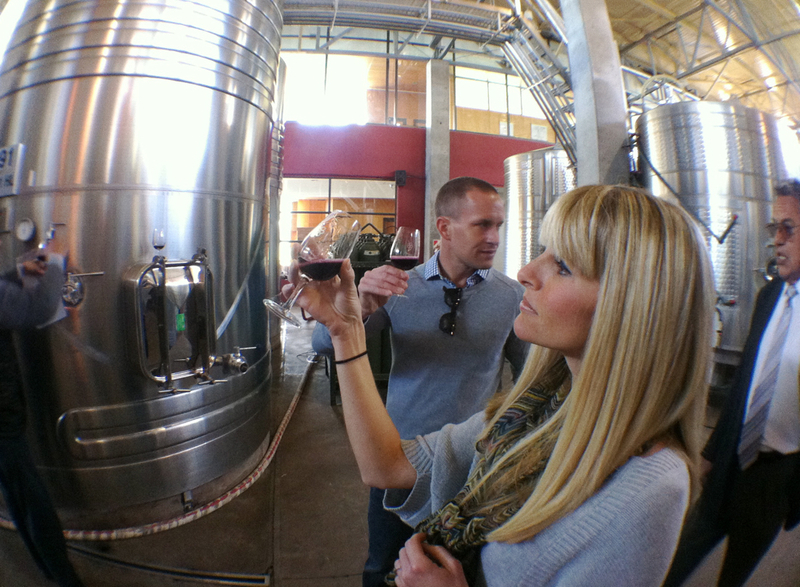 I won't bore you with the details of how the wine tasted (it was amazing! ), but, I can help you figure out a game plan if you make the wise decision to travel to this intriguing part of the world. My brother-in-law Jeff and sister Julie visited a few years ago and figured out exactly what to do, so this time around when I joined them, it was smooth sailing. 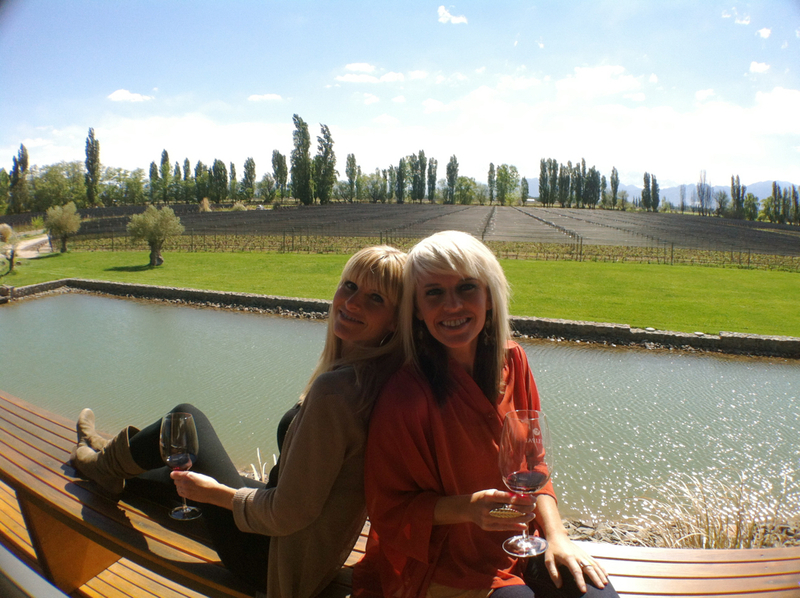 You have a few options on getting there, but I am unsure if there are many direct routes to Mendoza from the U.S. Generally, you will have a layover in Buenos Aires, or we chose to fly into Santiago and then onto Mendoza. We picked American Airlines because it requires fewer reward points to fly to destinations like South America -- we were able to each fly on a multi-city flight for only 40,000 AAdvantage points each. When budgeting, please remember that Argentina requires a reciprocity fee for any Americans entering the country for the first time. The price is a steep at $160. 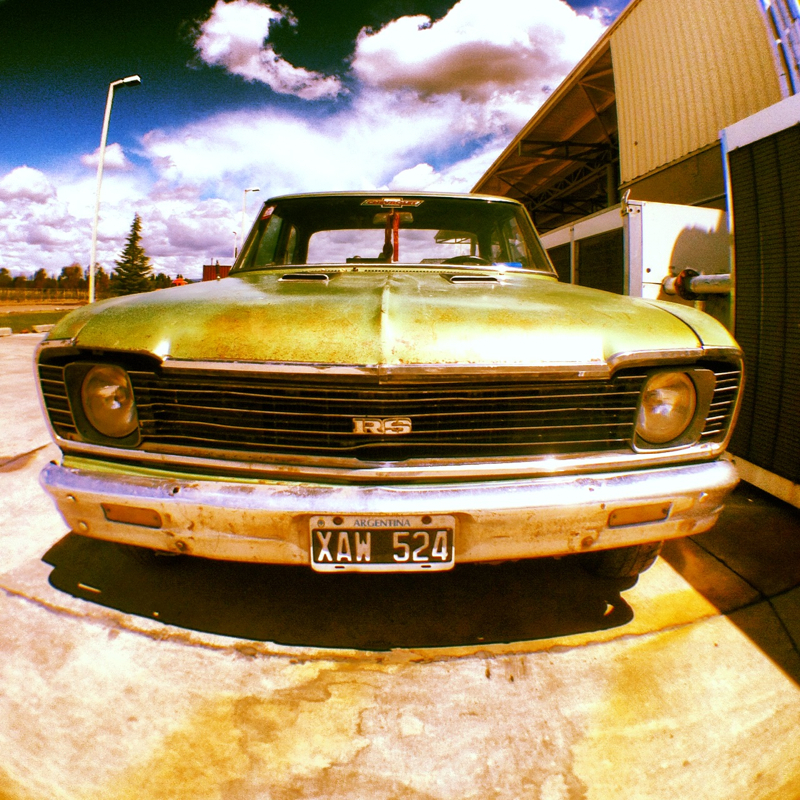 Check the Argentine Tourism website for specific details. 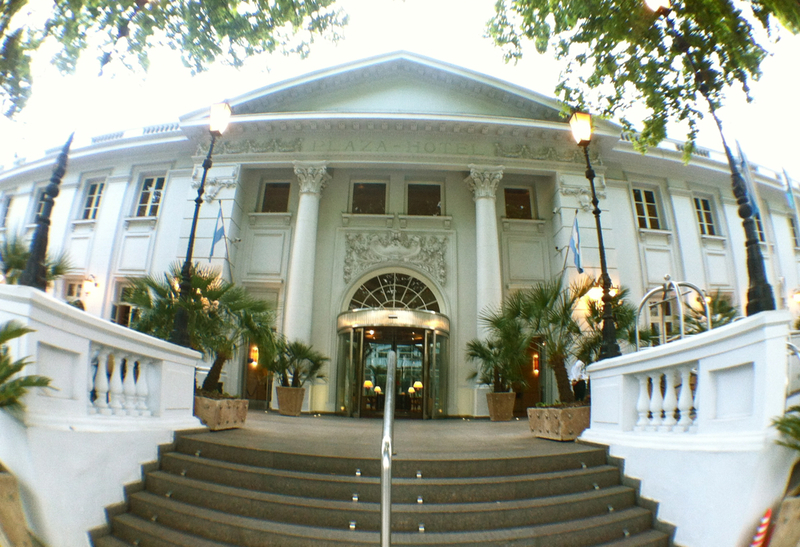 We managed to utilize hotel points to stay at the Park Hyatt Mendoza, which Julie and Jeff enjoyed on their previous trip as well. Situated across from a quaint park, the facade resembles that of a stately mansion. In the summer, the gorgeous pool deck provides a sunny vista for relaxation. The Park Hyatt also boasts a first-class breakfast -- an essential to fill up before hitting up the wineries. 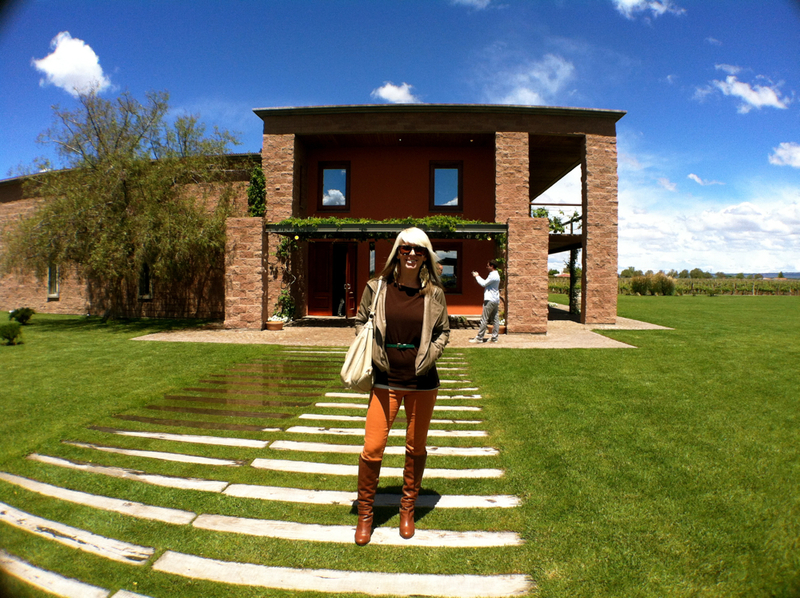 No matter what time of year you visit Mendoza, dressing appropriately is key to your enjoyment. I would call the recommended style "rugged sophistication". Nothing too fancy. Girls, don't wear pointy heels and remember to dress in layers as the mountain air can get quite chilly sometimes. Cellars are kept at a constant 55-degree temperature, so no matter what time of year you visit, you'll experience a variety of changing climates. My go-to shoes were my Cognac knee-high wedge boots: not too tall, but I didn't feel under-dressed either. I know it sounds crazy, but our first bodega (Spanish for winery or wine cellar) appointment of the day generally started at 9:30 am, which required an 8:45 am departure from our hotel. I protested this idea at first (I love to sleep in if at all possible) until Jeff explained to me why. 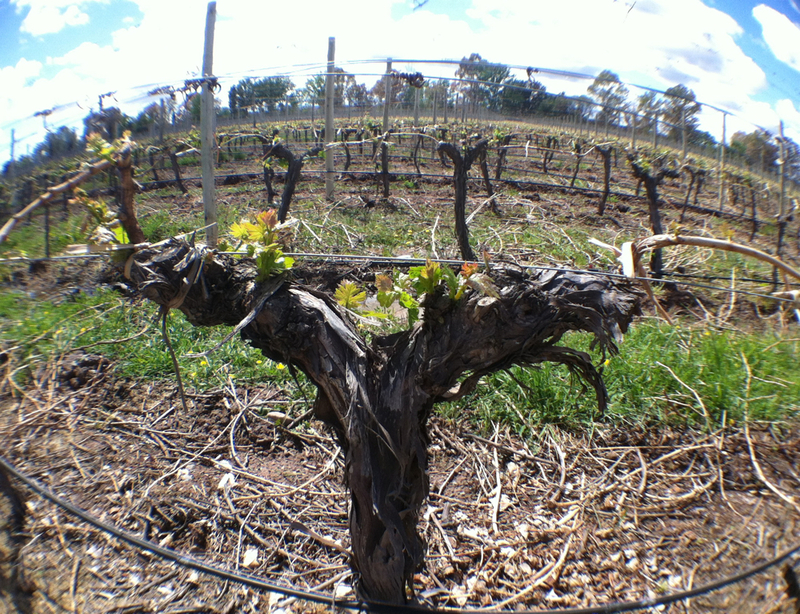 The best plan, in his opinion, is visiting three wineries a day. 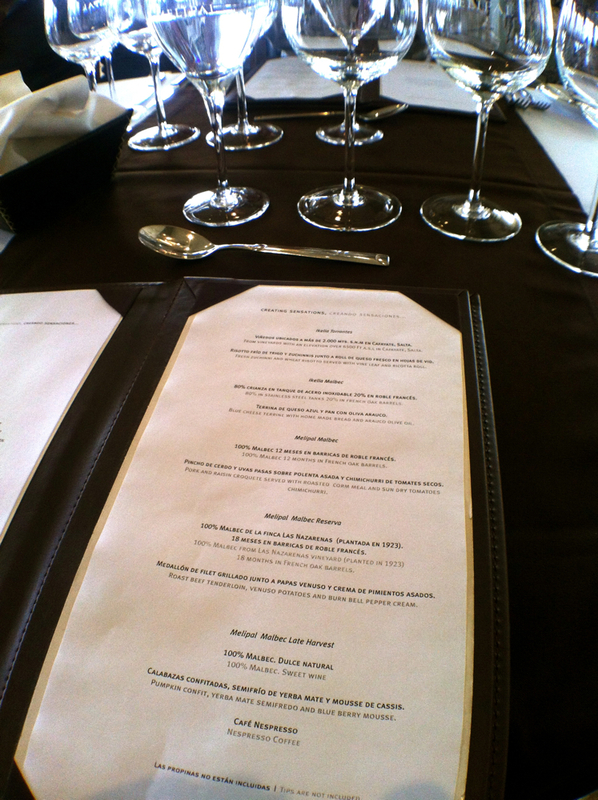 The last winery of the day includes your epic 5+ course lunch and wine pairing. This will be the highlight of your day, taking several hours and requiring a long nap afterward (on the car ride home, hotel room or both) to recover from this over-indulgence of the senses. Reservations or just "wing" it? Most of the wineries only took reservations, making it essential to coordinate with the hotel concierge on the times and availability. 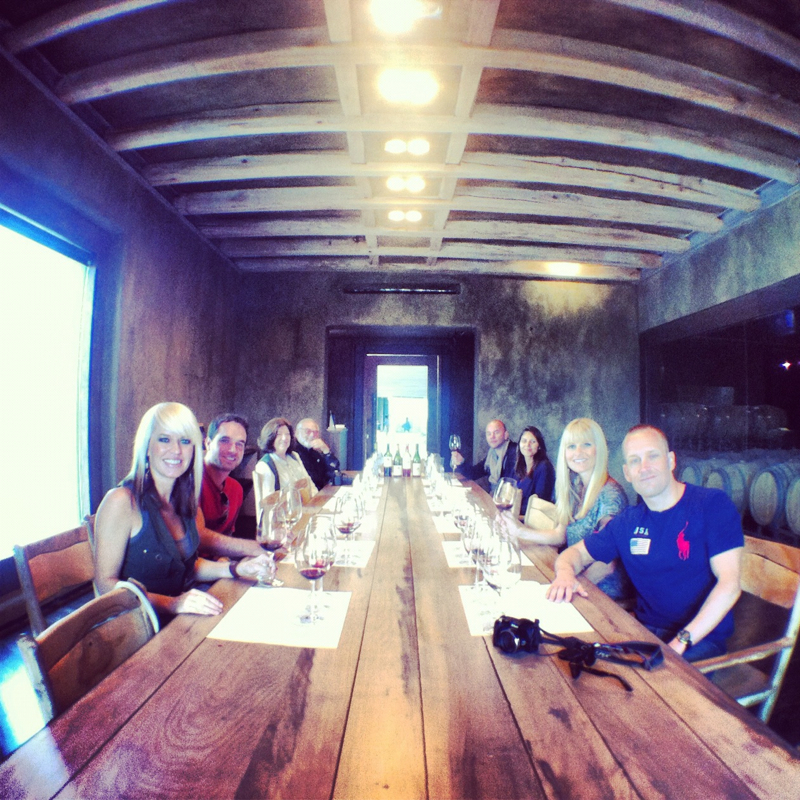 Don't expect to show up at the larger wineries without a reservation; they probably won't have room for you. 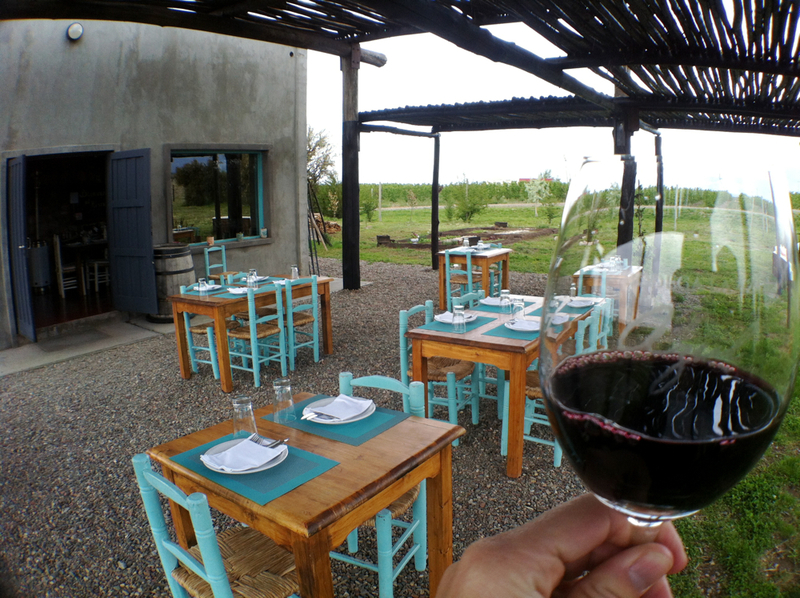 The smaller boutique wineries may leave room for some spontaneous tastings, like our experience at Bodega La Azul, but I wouldn't rely on that if you expect to get a full day of tastings in. 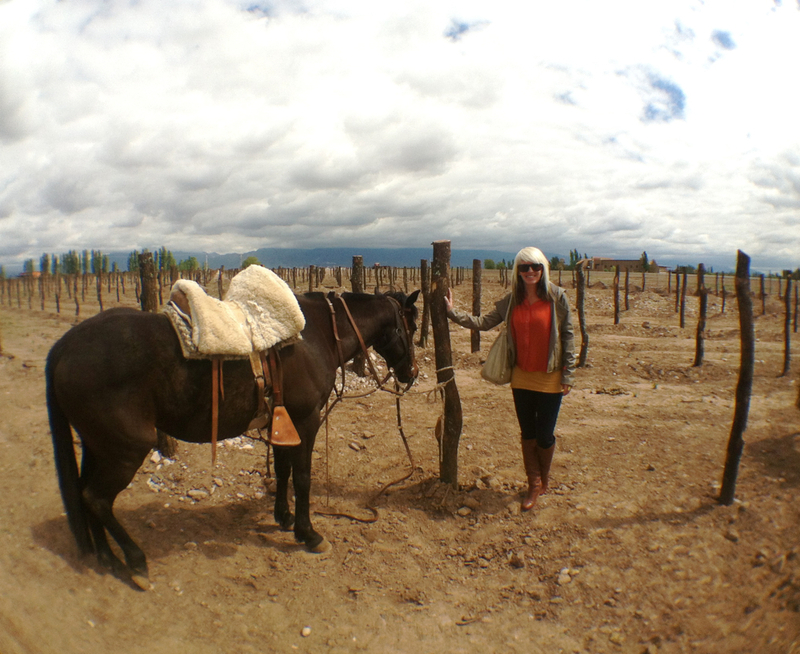 Side Note: Even though we didn't personally do this, we did see some people arrive at the bodegas by horse-back. The scene looked straight out of a film. I am sure this is much more expensive, but if it's the trip of a lifetime, you may have the means to splurge on this gaucho adventure. 8pm Azafran for Dinner (Hyatt booked the reservation for us). I love Azafran because of its relaxed, farmhouse feel. The first thing we did was enter the temperature-controlled wine cellar adjacent to the main dining area, where an on-site sommelier is ready to assist you. 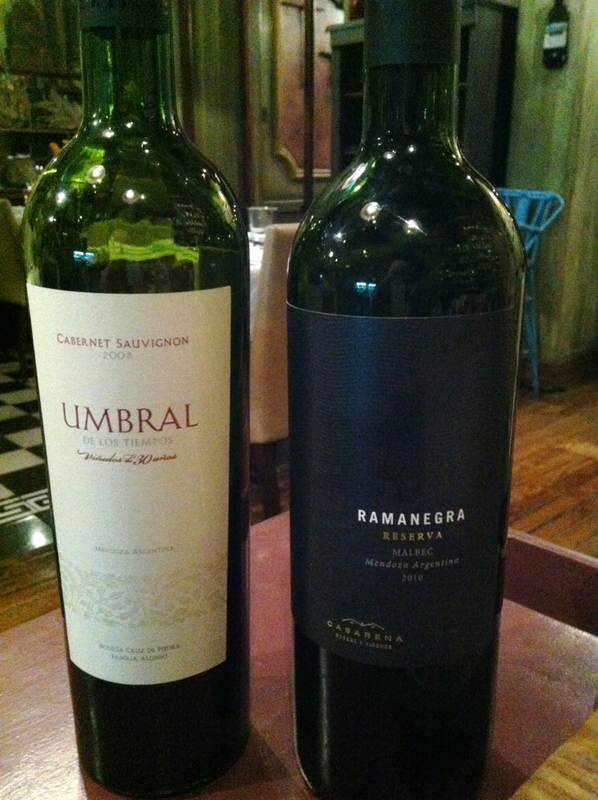 Julie and Jeff chose Umbral De Los Tiempos 2008 Cabernet Sauvignon, while Joe and I selected the Ramanegra Reserve Malbec 2010, still one of my favorites from the whole trip, and that is saying a lot. The walls of Azafran are lined with various olive oils from the region, along with locally grown jarred olives. 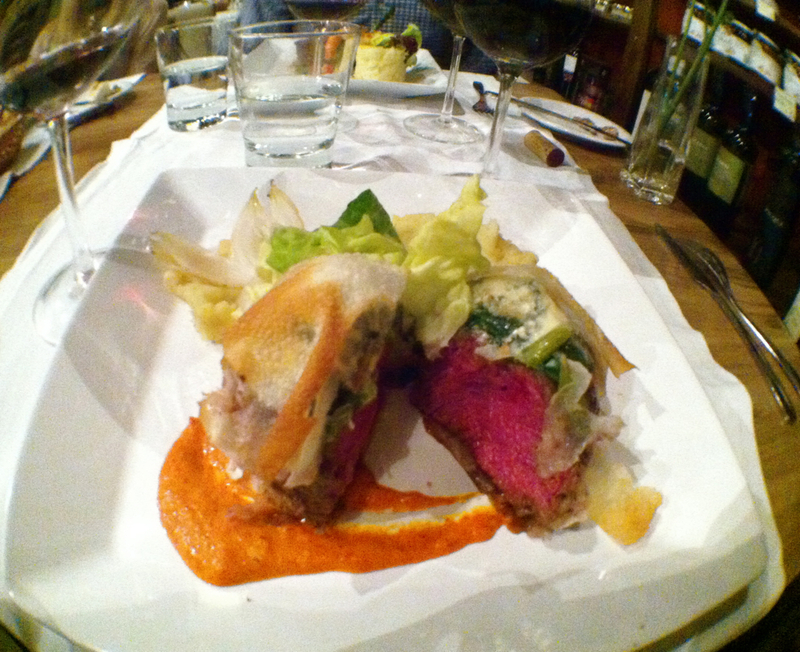 We also had our favorite dish here -- dough-wrapped Filet Mignon featuring blue cheese and spinach, accompanied by sweet potato honey puree and a roasted bell pepper sauce. I thought Joe was going to die from happiness once he took his first bite. My poultry dish was to die for as well: quinoa-encrusted chicken breast with buffalo mozzarella, ricotta goat cheese and eggplant rolls topped with spinach cream. 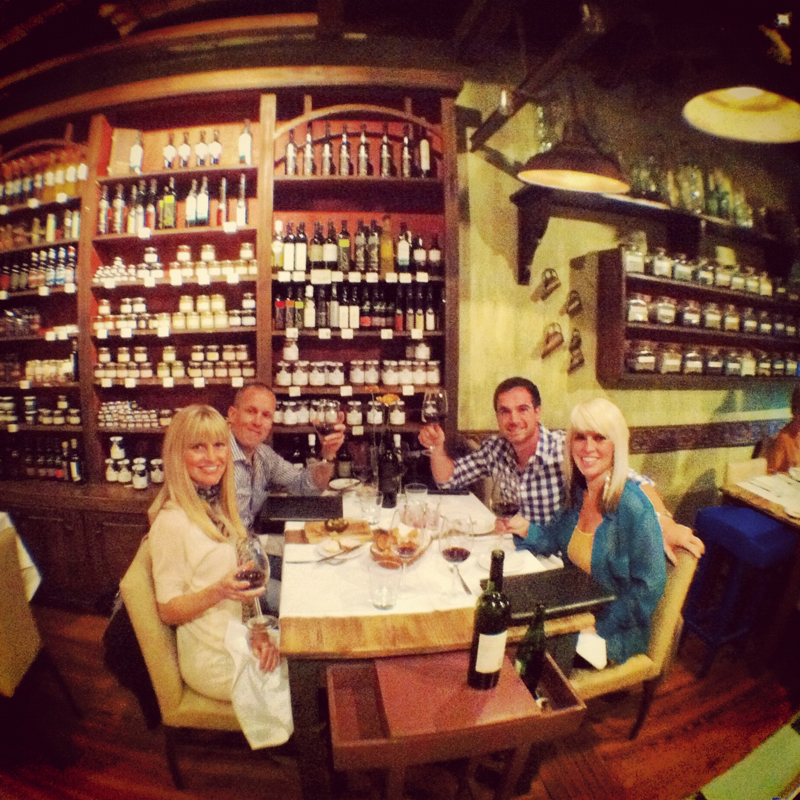 10:00 Bodega Atamisque (Jeff personally booked this reservation a few months prior). For my very first bodega, this was a great start. 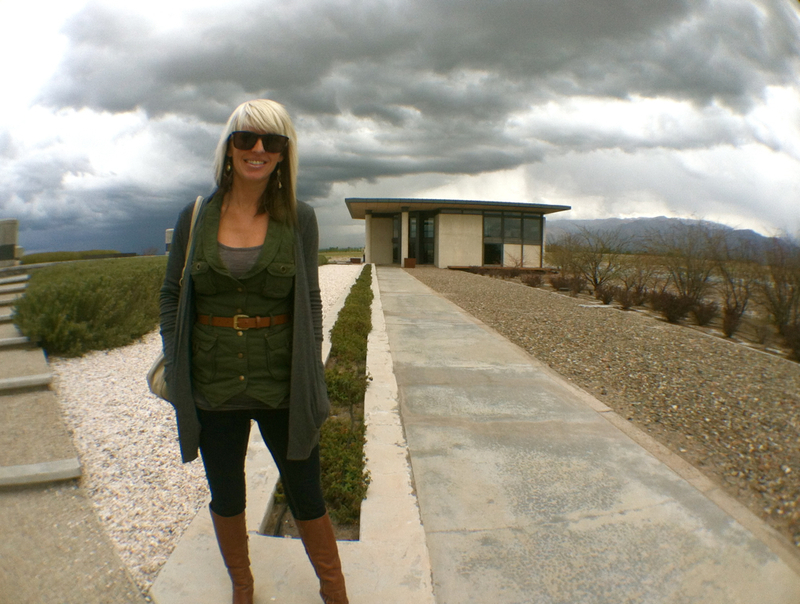 I especially loved the tasting room with an extended 14-foot farm table. 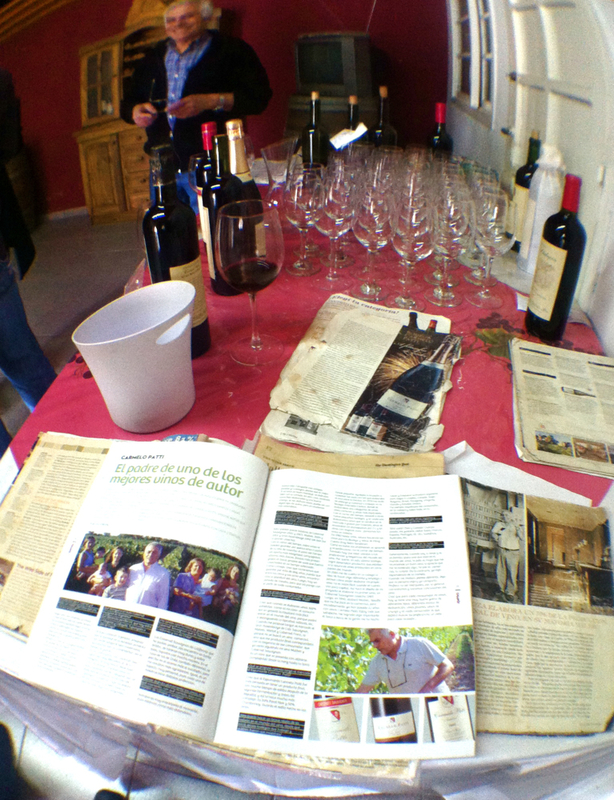 I knew from that first tasting that I was going to love Mendoza. 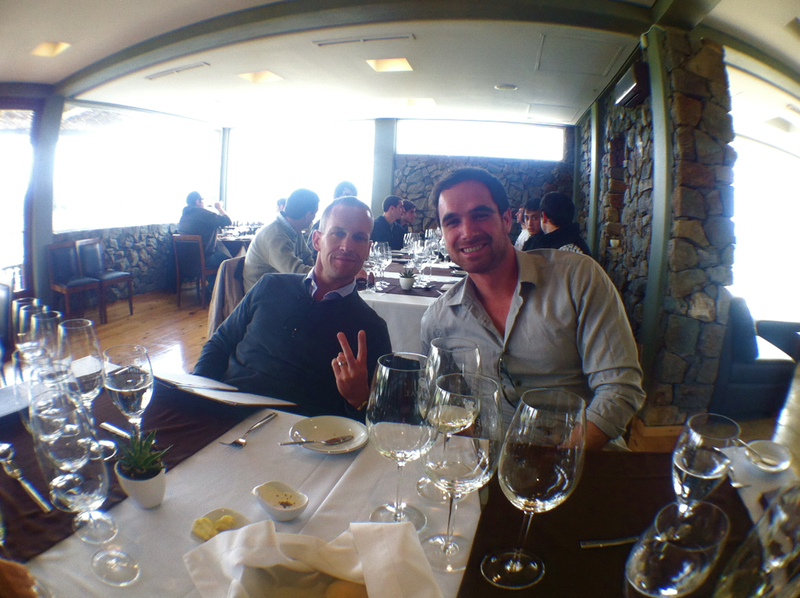 11:30 – Salentein (Two weeks before, Jeff requested Hyatt to book this reservation). Although we were on our way there, we ended up taking a detour to a small boutique bodega called La Azul. 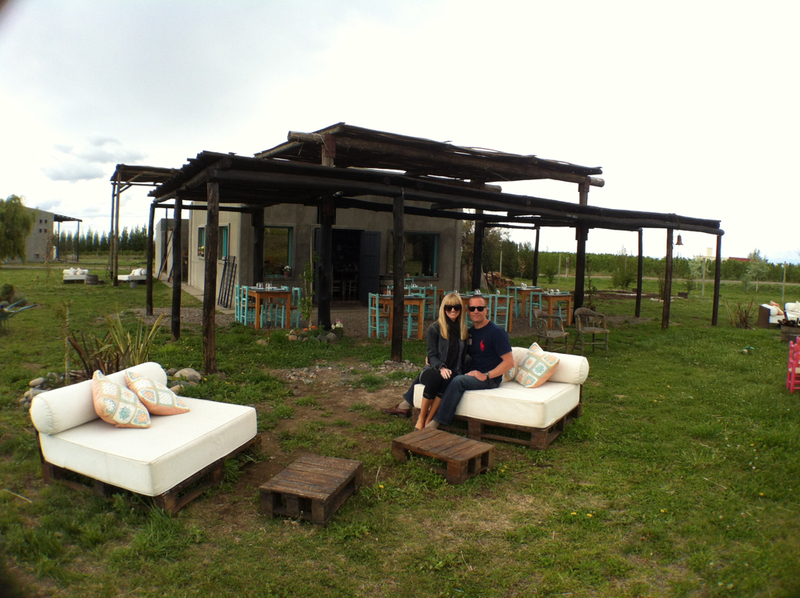 It featured outdoor furniture arranged in the grass and a small tasting room with light blue painted furniture; it was quite charming. 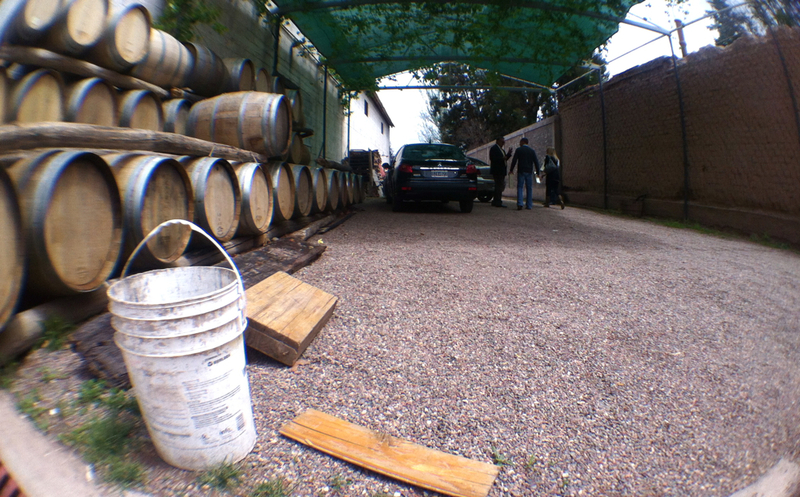 Pedro arranged with the manager for us to do a tasting in the rear of the winery from the stainless steel barrels. 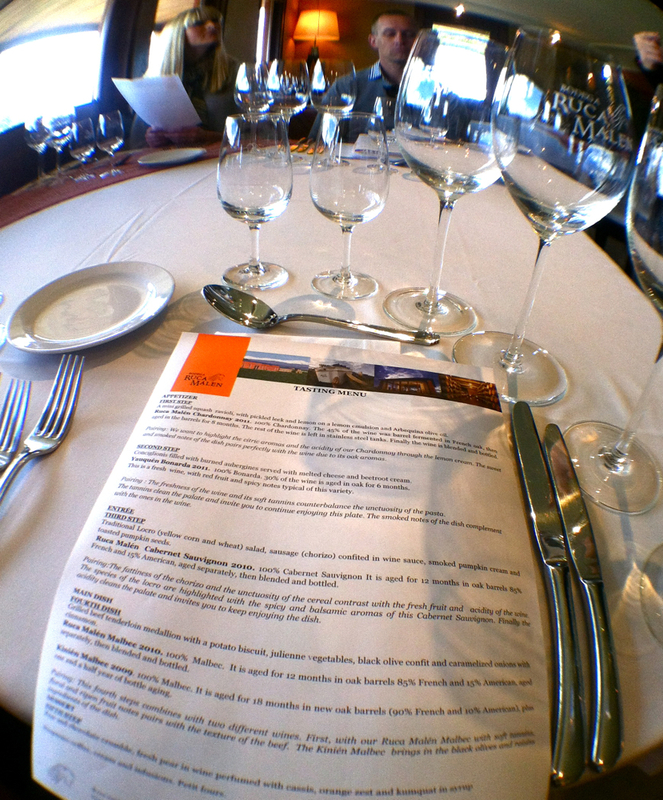 1:00 O Fournier Tour and Lunch (Hyatt booked this reservation a few months in advance). 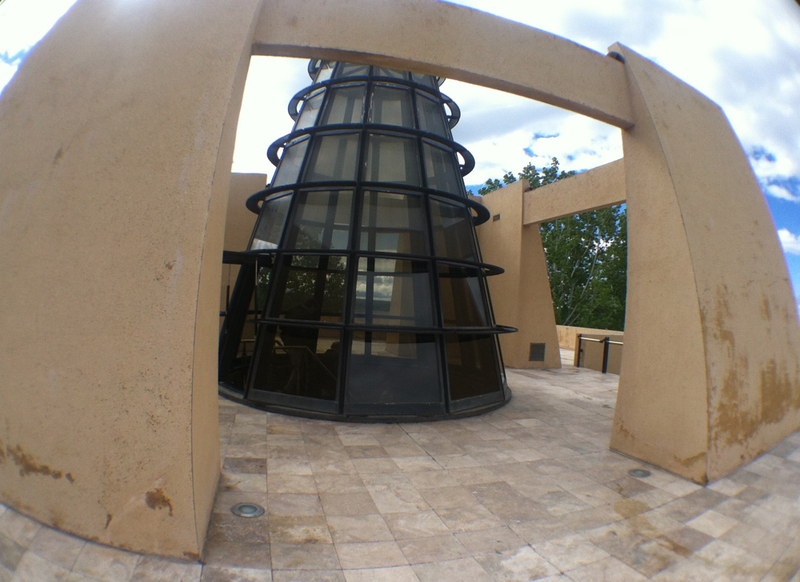 This has to be my favorite winery in terms of architecture. 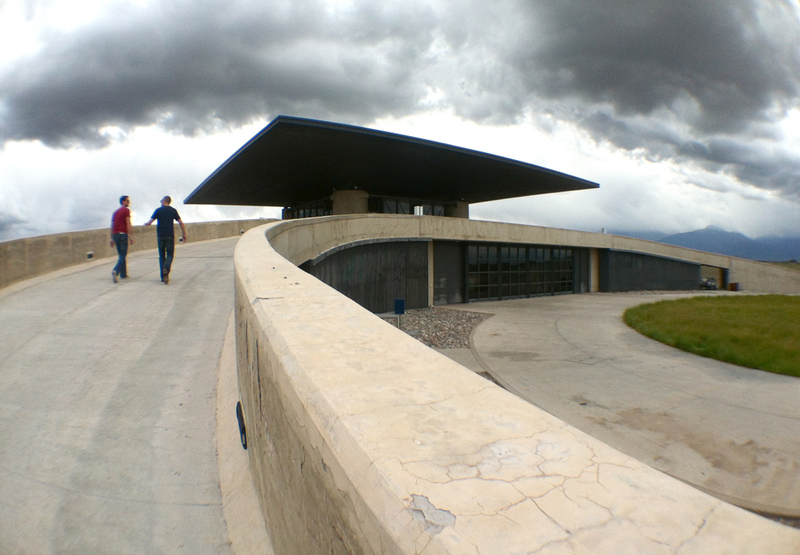 On the drive approaching the winery, you can see this spaceship-like roof appear over the plains. 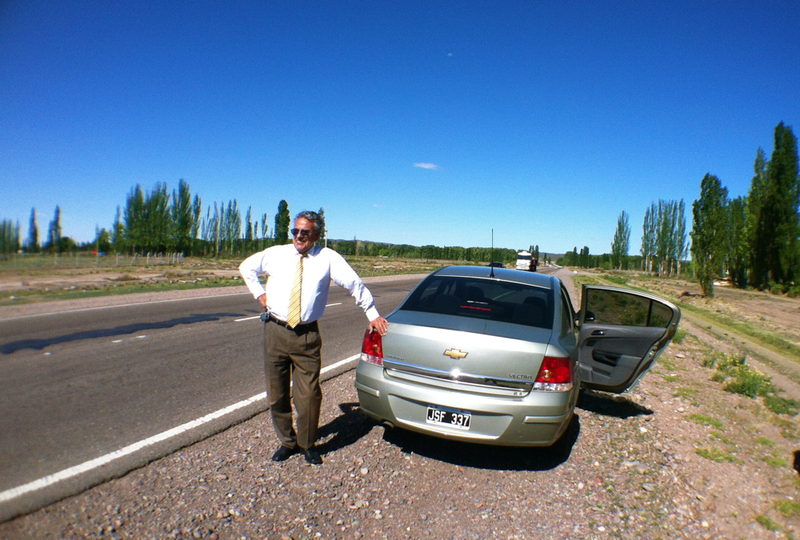 The Spanish owner was planting Tempranillo vines along the entrance as we pulled up. The design of this modern bodega utilizes gravity to minimize the use of pumps. 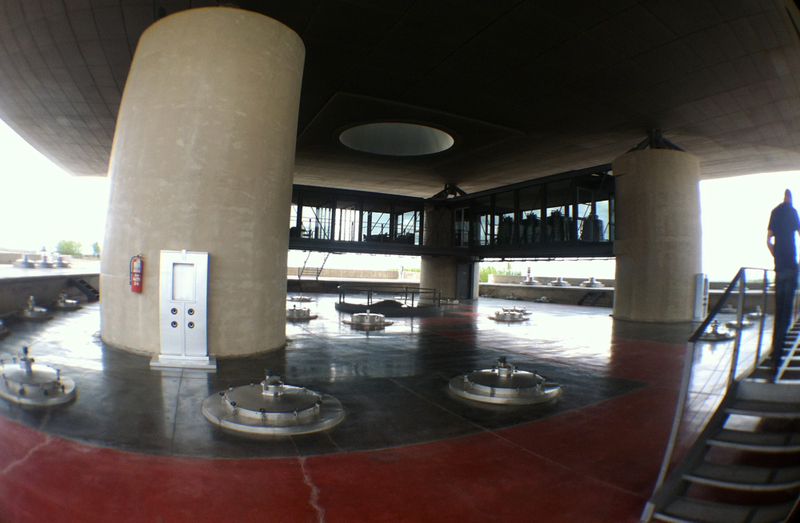 In the upper observation deck sits an innovative laboratory with microvinification capabilities. The 2,800 oak barrel underground cellar is the most impressive wine storage room I have ever seen. 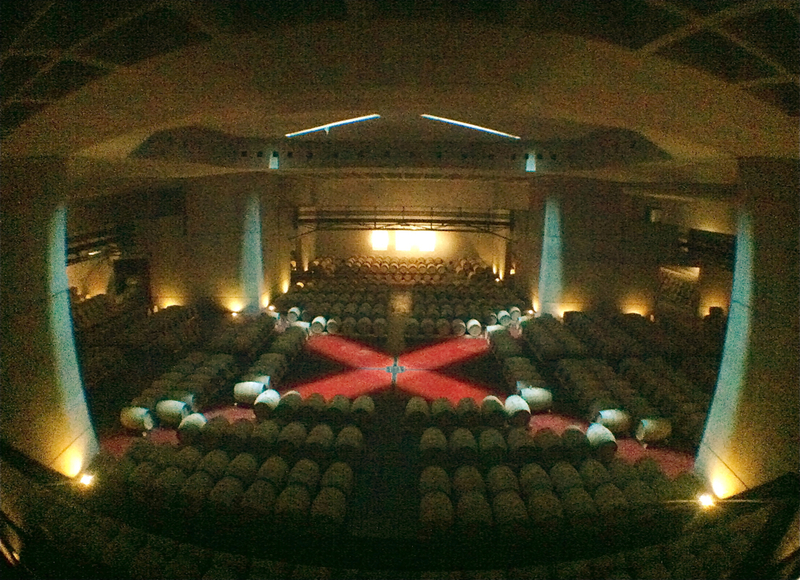 Dimly lit for the most part, the drama comes from a glowing red cross centrally beaming from the floor. 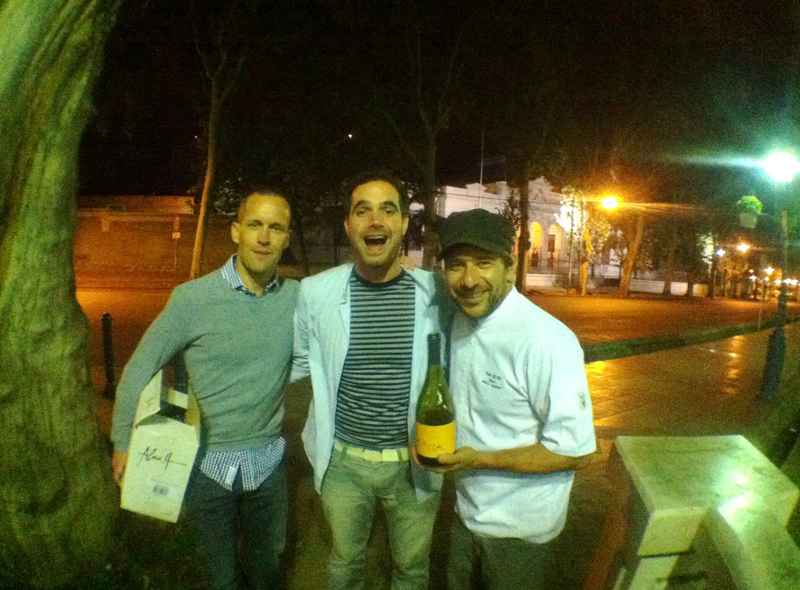 Many wine enthusiasts may be familiar with O Fournier's popular Urban Uco line, especially their Torrontes. My first bodega lunch began on a high note as the staff had reserved a special room for us overlooking the two-story dining room. 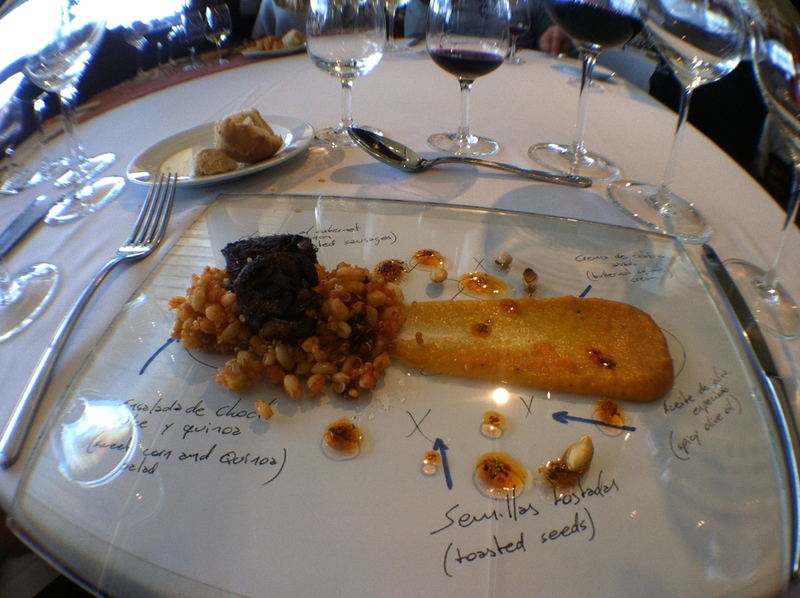 I couldn't believe the amount of food that was presented to us in such an artful manner. Dinner: After we freshened up in the room, we decided on pre-dinner drinks at The Vines of Mendoza. If you can't make it to all the boutique wineries while you're in town, this is a great place to sample all the region has to offer. We had the chance to meet the founder of The Vines, an American named Michael Evans, along with the Manager of Sales, Richard Cauldwell. It was a pleasure meeting them both and hearing about their new project, The Vines Resort and Spa which features a luxurious getaway in the Uco Valley. Even better, The Vines recently announced they have enlisted renowned Argentine culinary expert, Francis Mallman, as the executive chef. I am excited to see what will come of this! After drinks, we walked into downtown Mendoza -- a whole strip of bars and restaurants, many with outdoor seating. We settled on something casual like empanadas and pizza -- a great choice after such a rich lunch. This was THE number one bodega I wanted to visit since Catena Malbec was the first Malbec I had ever tasted, which hooked me immediately. 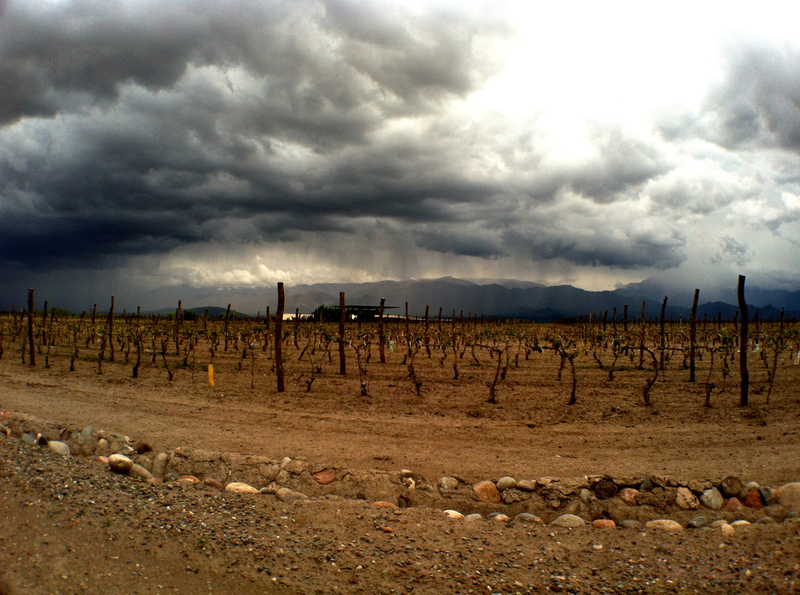 Their innovation in Argentine winemaking helped launch Mendoza into the global spotlight. 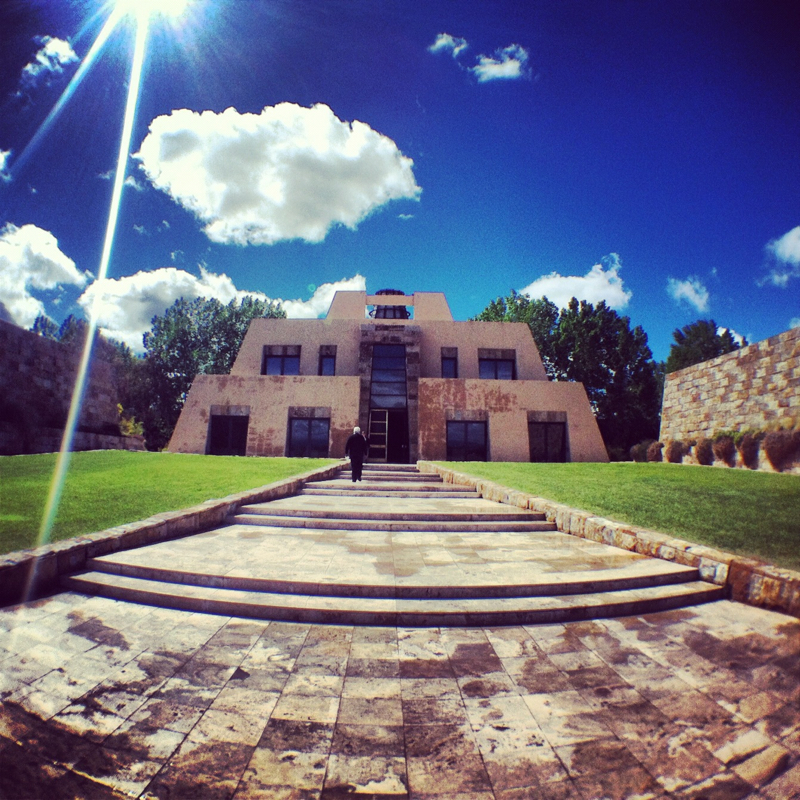 The winery is shaped like a pyramid, a nod to Mayan Architecture and what the New World has to offer. 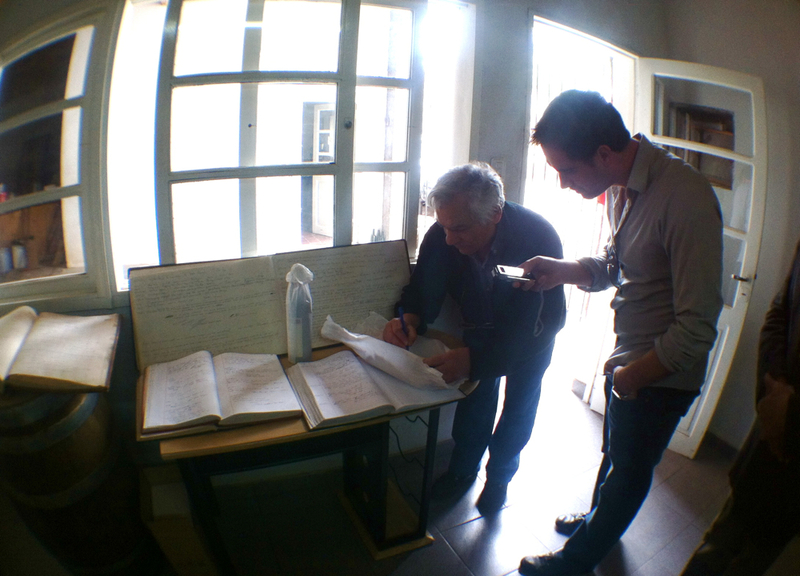 During our tour, we had the chance to enter Catena's exclusive wine cellar containing a priceless collection of vintages. 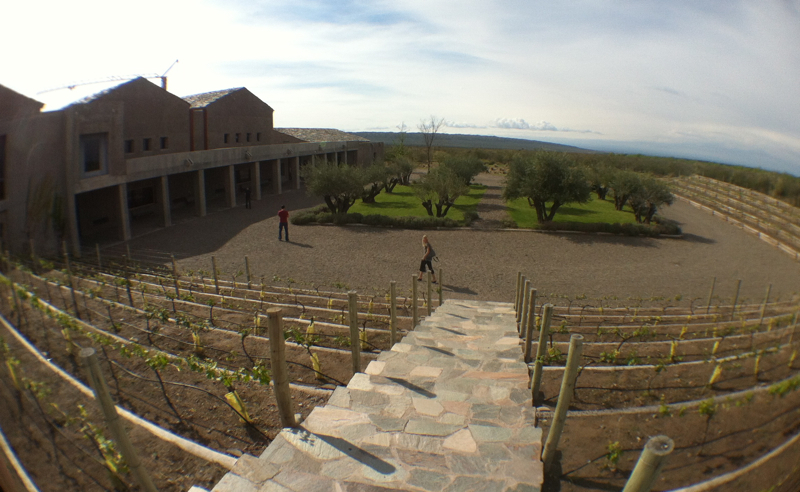 In the center of the building, a staircase juts back and forth leading to various levels of the building and also onto the roof, providing magnificent views of the bodega. 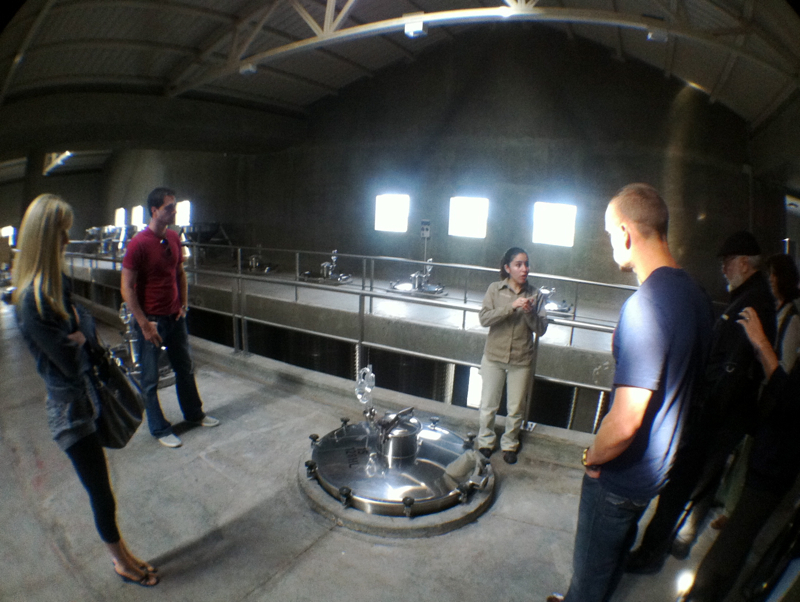 Our guide, Tatiana, was both friendly and informative as she lead us on the tour and personal tasting. 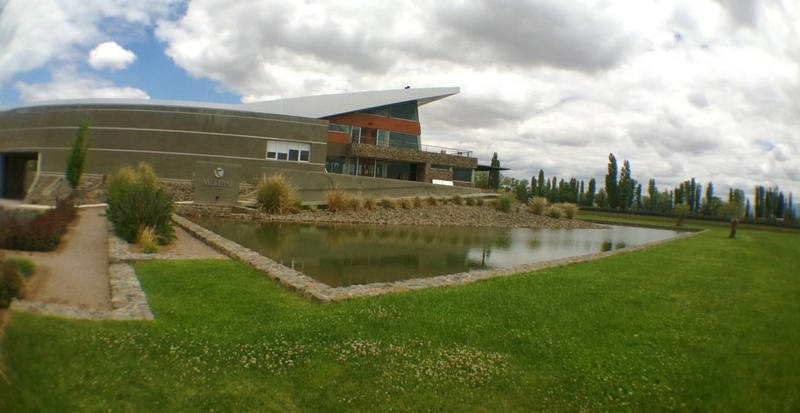 11:00 Tapiz; Their bodega is not the most impressive compared to some of the other ones, but we got some personal service from Juan Lunez, who took us through the vineyards. He explained the harvest season process, giving us a little insight into the field hands who work at the bodega. 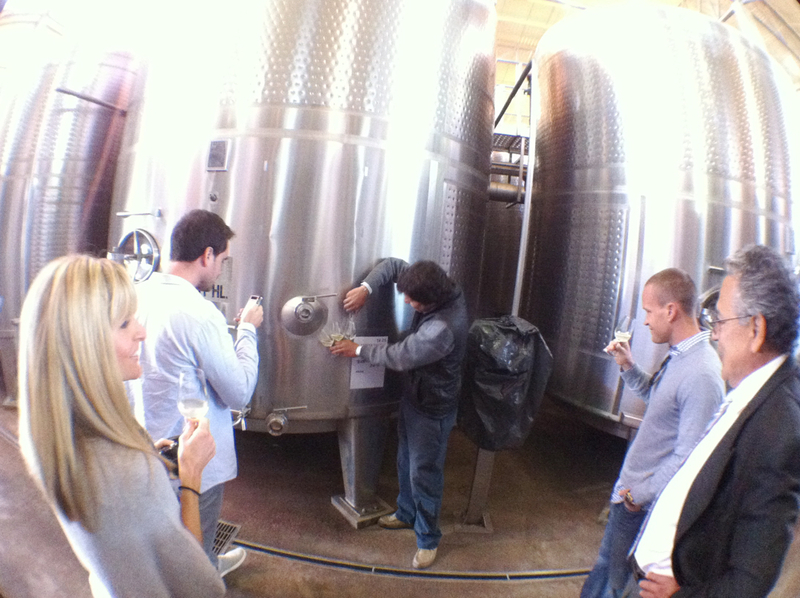 We were able to sample several different wines like Torrontes and Cabernet Franc from the stainless steel barrels. 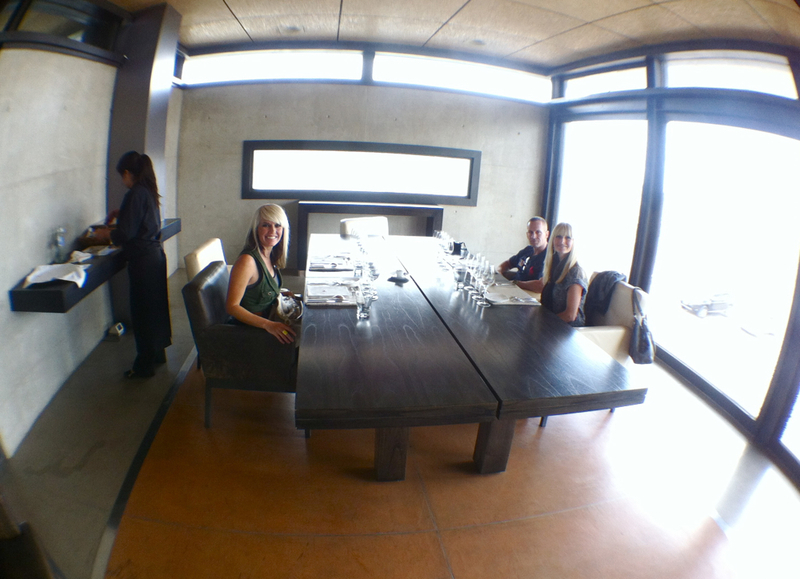 12:30 Ruca Malen Lunch (Jeff personally booked this reservation). We managed to get a beautiful table in front of a large picture window. 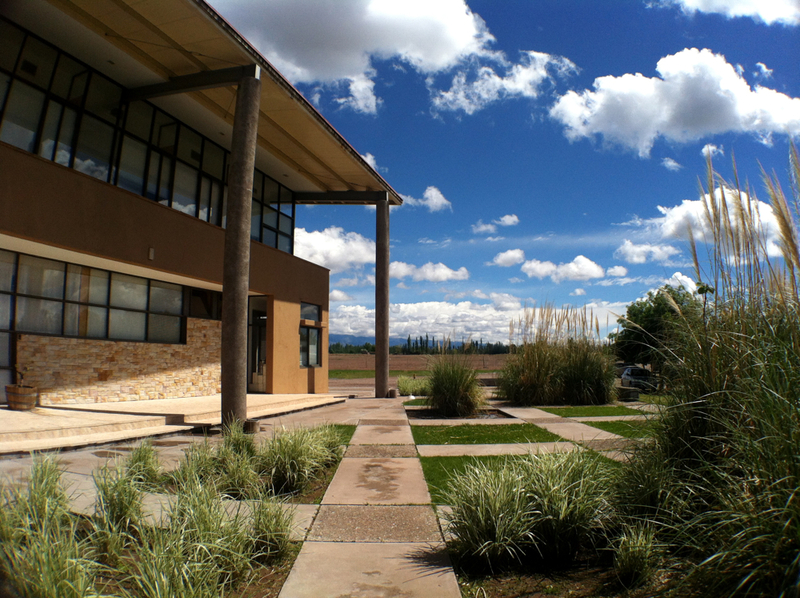 The view of the Andes in the distance and the lush green grass of the bodega made for some great photos, but the service and menu are second to none. I particularly loved the entree before the main course. Not only was the Locro Salad scrumptious along with the chorizo and smoked pumpkin seeds, but I really loved the presentation on a glass slab with notes explaining the dish. 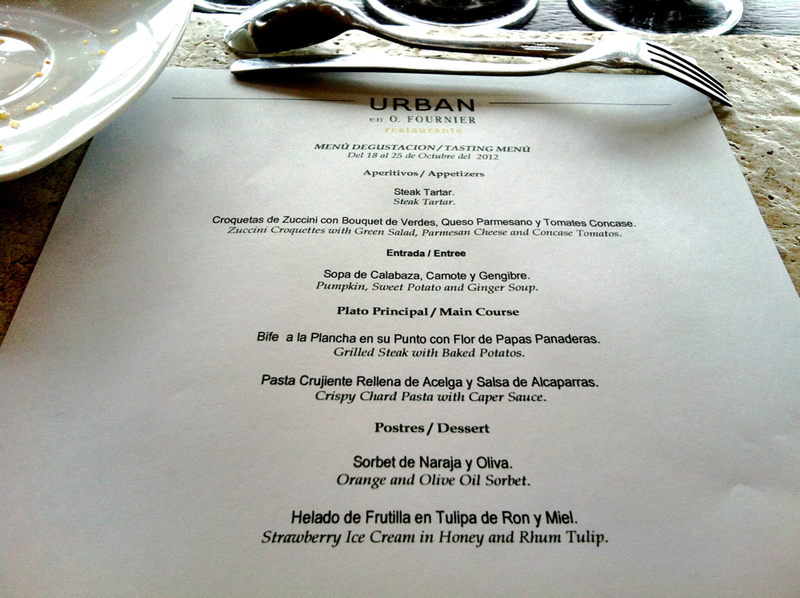 Dinner: We chose Siete Cocinas, where Chef Pablo Del Rio's cooking is inspired by the seven regions of Argentina. Condé Nast Traveler highly recommended this restaurant, so we had to check it out. 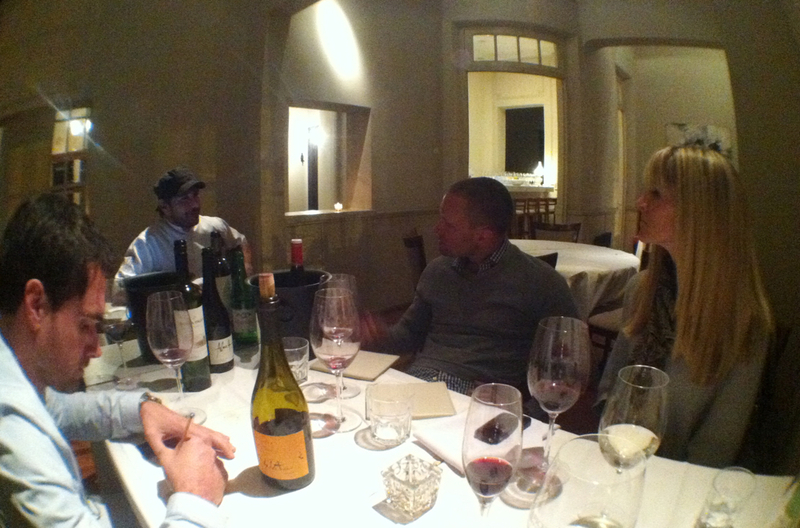 We had the privilege of meeting Pablo at the restaurant, where he spent quite a bit of time chatting with us at or table and pouring us tastings of Bonarda, the second most commonly grown variety in Argentina. 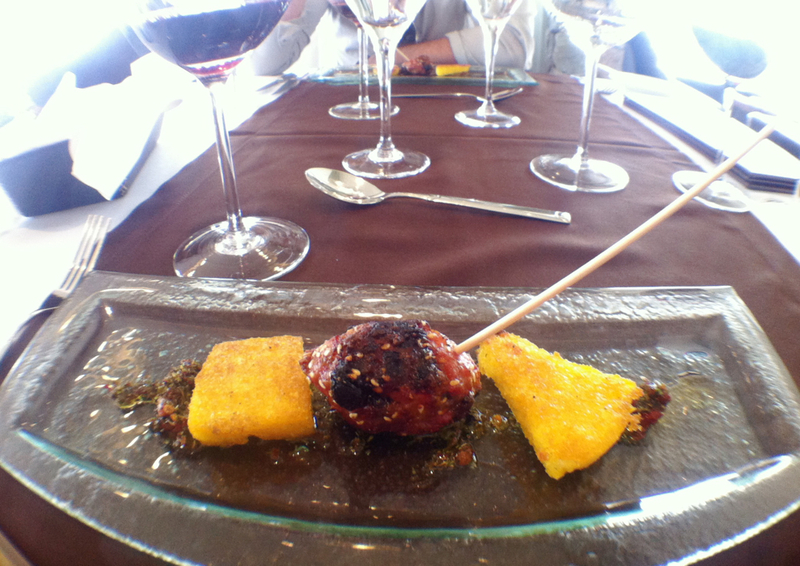 Bonarda also knowns as Charbono, tends to be dark, with medium to high tannins and acidity. A few highlights of the night included an introduction to his friends, José Alberto and Sebastián Zuccardi, one of most important winemakers in Argentina. 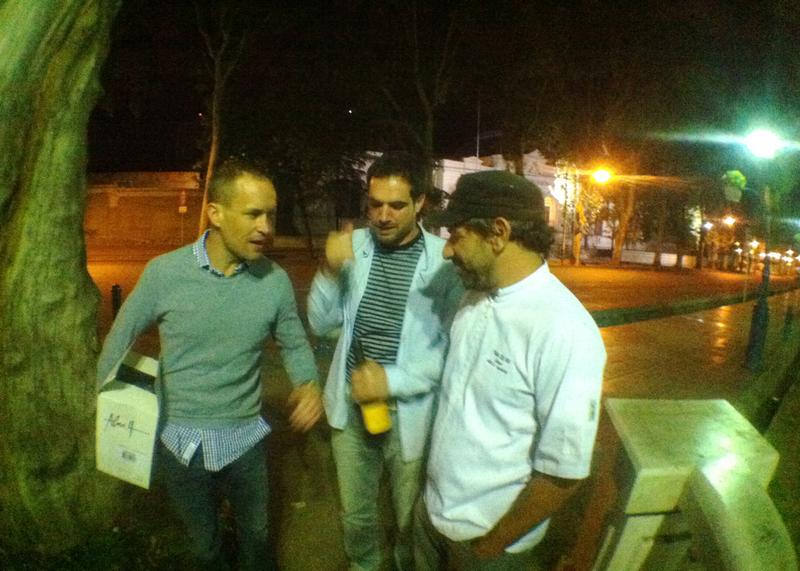 They had been mixing wine in the basement of Siete Cocinas, and as they were leaving, Pablo introduced us to them. I thought my brother-in-law Jeff was going to have a heart attack! He couldn't believe he was meeting a family he had read so much about in magazines like Wine Spectator. 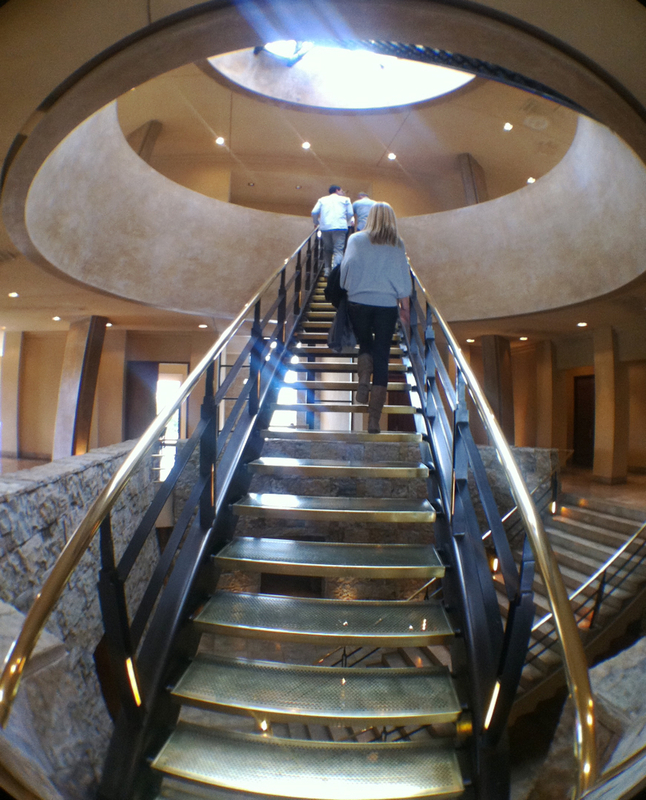 We ended up staying so late that Pablo offered to walk us back to the Park Hyatt. 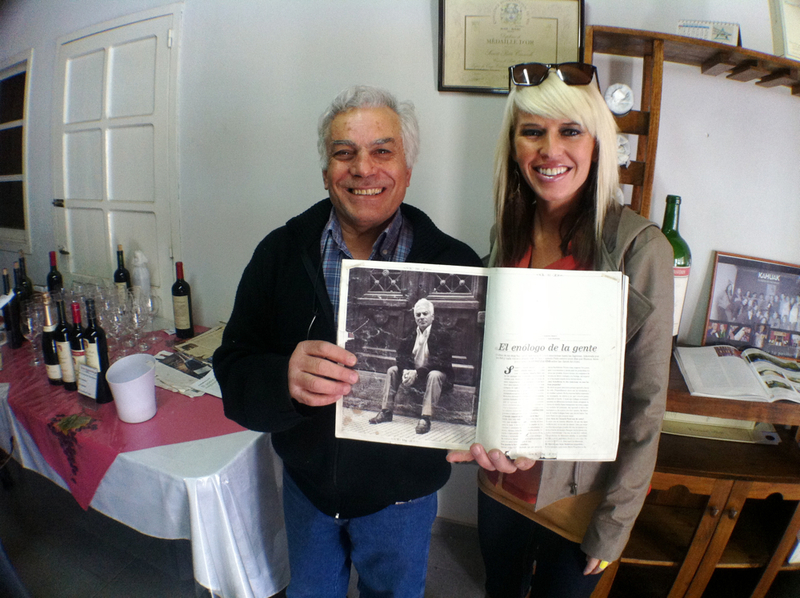 He even grabbed a bottle of open wine which we all shared as we walked the streets of Mendoza. Was this real life??? 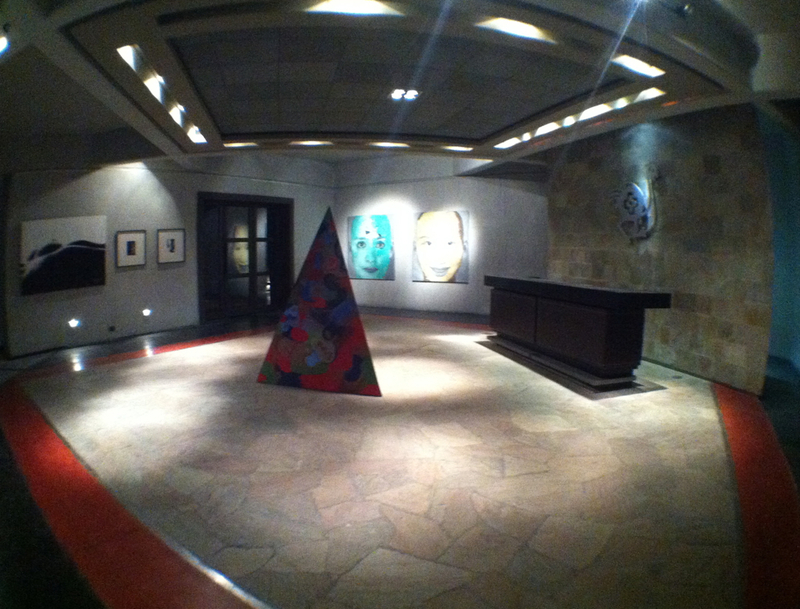 What a hilarious and memorable way to end our last full evening in Mendoza. I have to say that after my third straight day of wine tasting, the thought of trying another wine was almost unbearable. For some readers, if you have any extra time, I would suggest taking a break this day to regroup and maybe explore the surrounding areas for hiking or adventure. However, if you're on a tight schedule, don't pass up the third day because you will regret it. You know that expression, "Hair of the Dog"? Well it was definitely the case as soon as I took the first sip of the day. 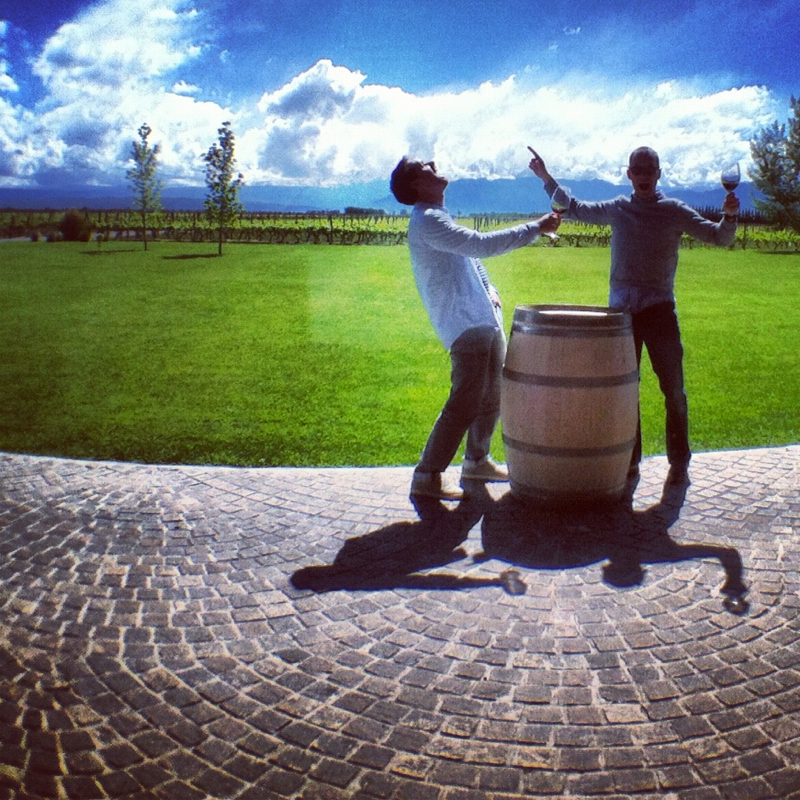 I was back on the horse, ready to seize the last day of my luxurious wine tour. 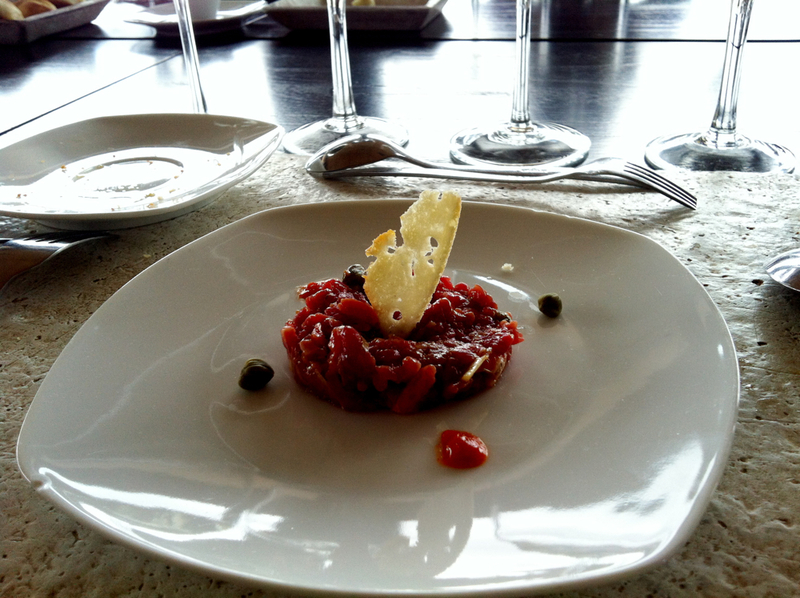 9:30 Vina Cobos (the week before, Jeff requested Hyatt book this reservation upon concierge suggestion). 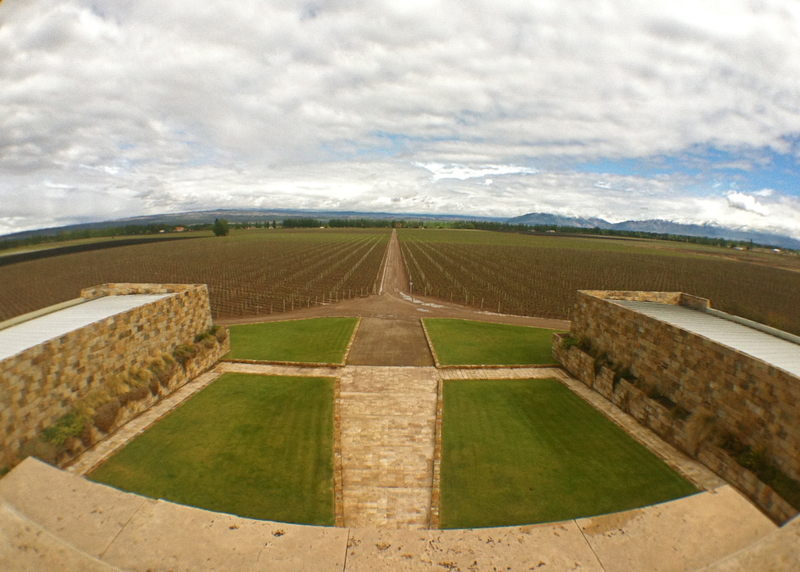 As of now, they only have a winery and are currently planting vines on-site. I love the modern rectangular structure, flat roof and large soaring windows. I favored the Chardonnay from here the most, which comes as no surprise since the winery is owned by Sonoma winemaker Paul Hobbs. 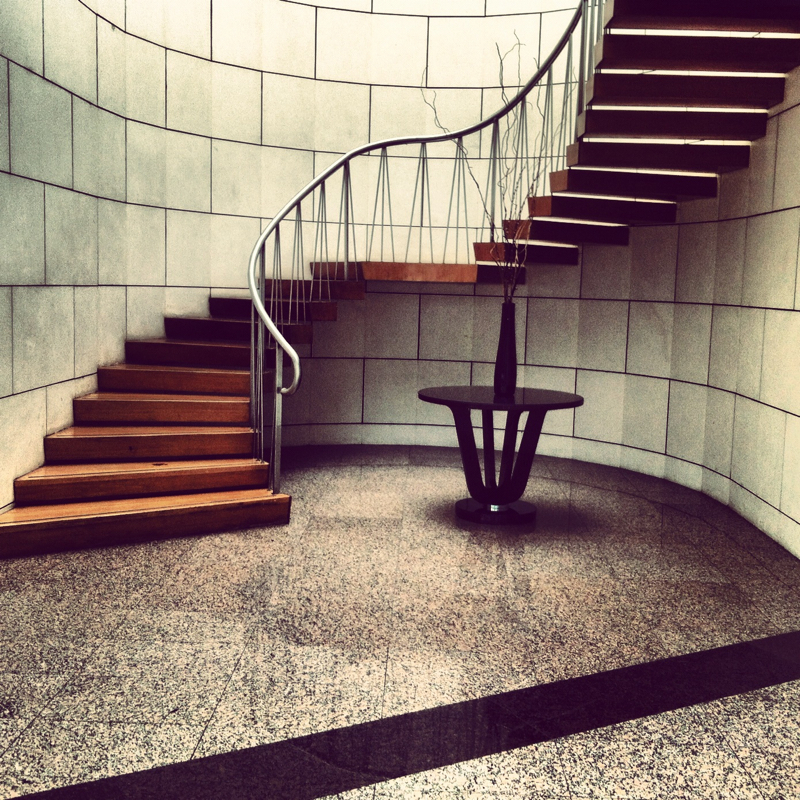 11:00 Bodega Carmelo Patti (Jeff requested Hyatt book this reservation). Meeting Carmelo Patti had to be one of the most unique experiences of the trip. 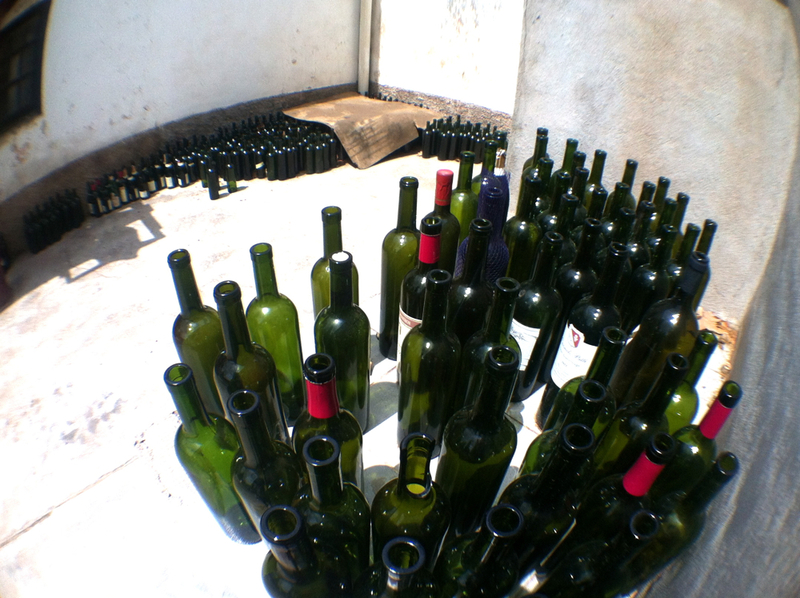 His bodega is no-frills, no-nonsense, with a whimsical display of empty bottles haphazardly lined up in the courtyard. 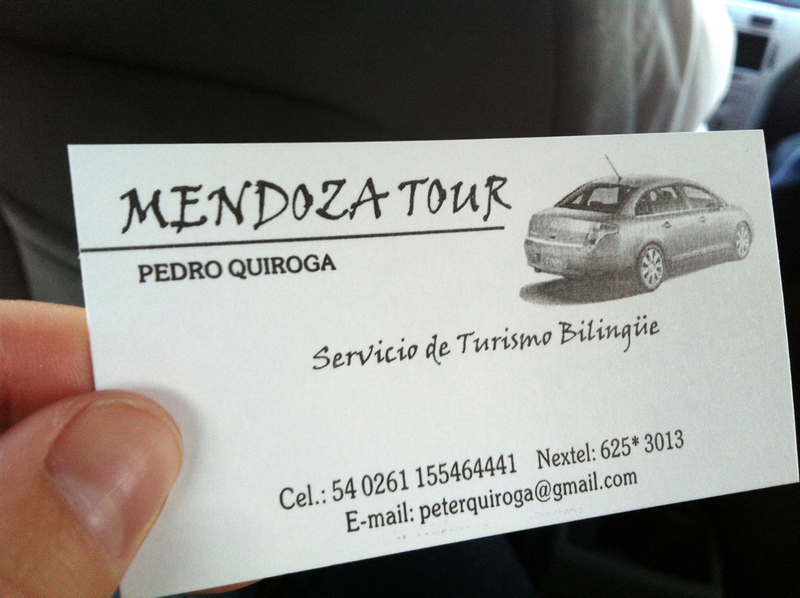 Carmelo spoke little English, so we relied on our driver, Pedro, to interpret our conversation with him. He has never advertised his wine and selects only the choicest grapes to create his "author wines", that is, he creates each of them by his own hand -- a true master craftsman. 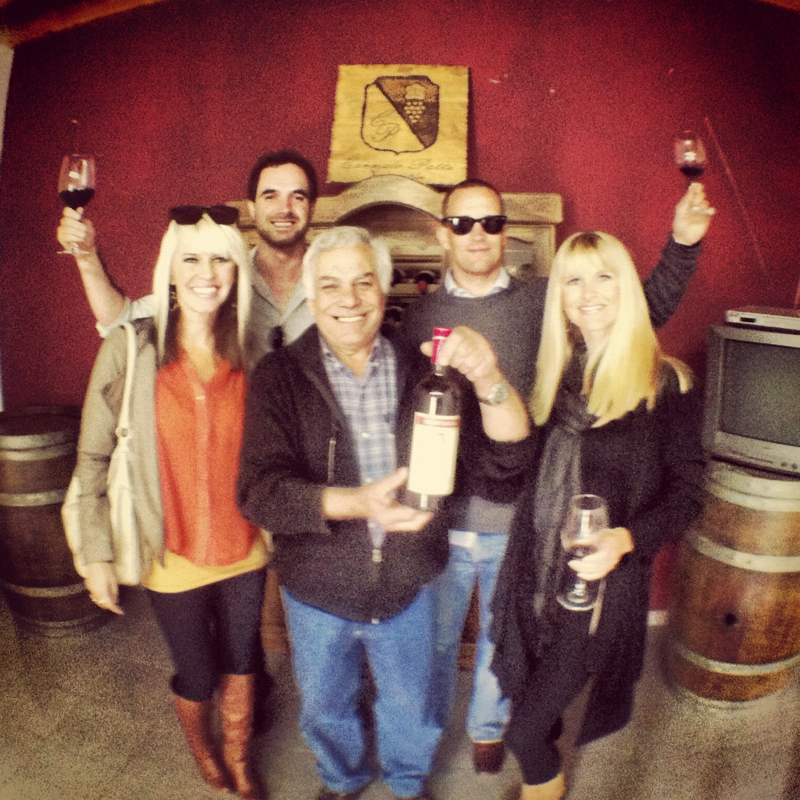 We made sure Carmelo signed our bottle after purchase, considering his winery is a one-man show. 12:30 Melipal Lunch (Three weeks prior, Jeff requested Hyatt book this reservation). 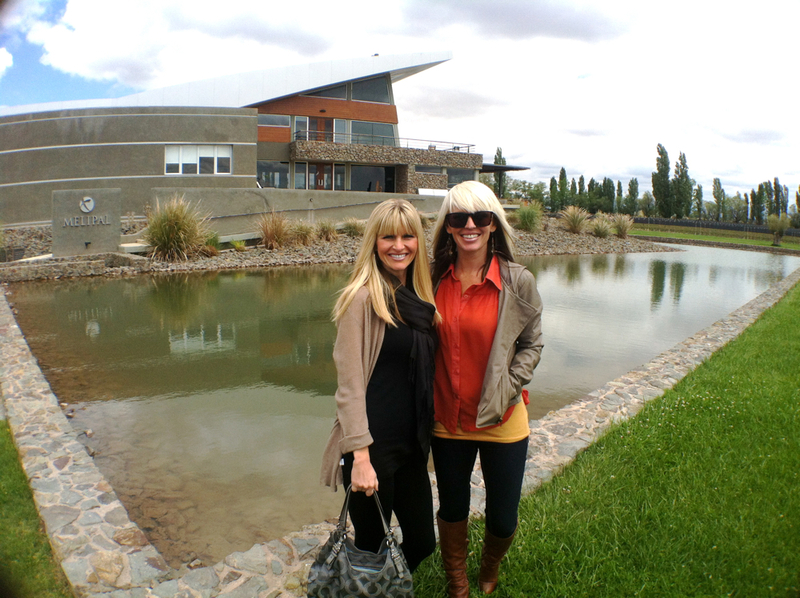 In true Mendoza-style, we end our last tasting/lunch at a scenic modern bodega overlooking a geometric man-made lake, the imposing Andes Mountains as our backdrop. 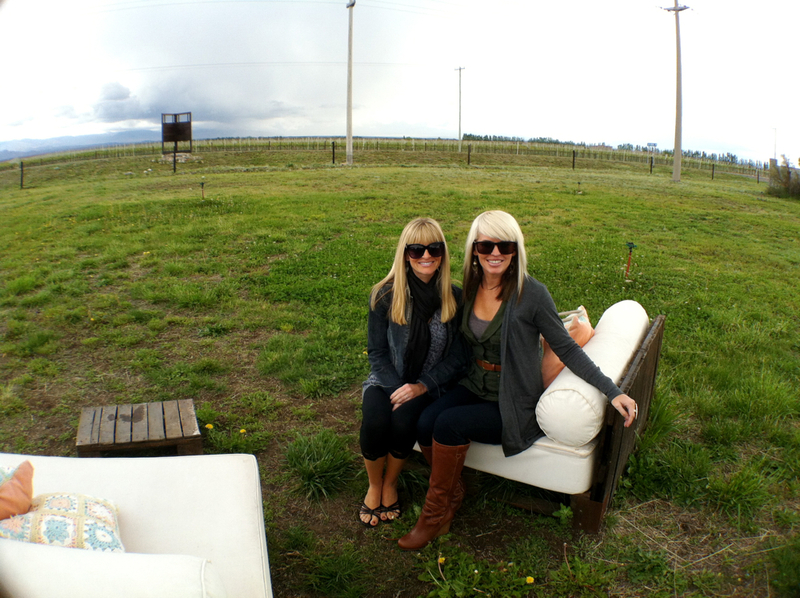 After our delicious lunch, we had the opportunity to lounge in the sun on the back porch overlooking a beautiful vista. Life couldn't get much better than this! 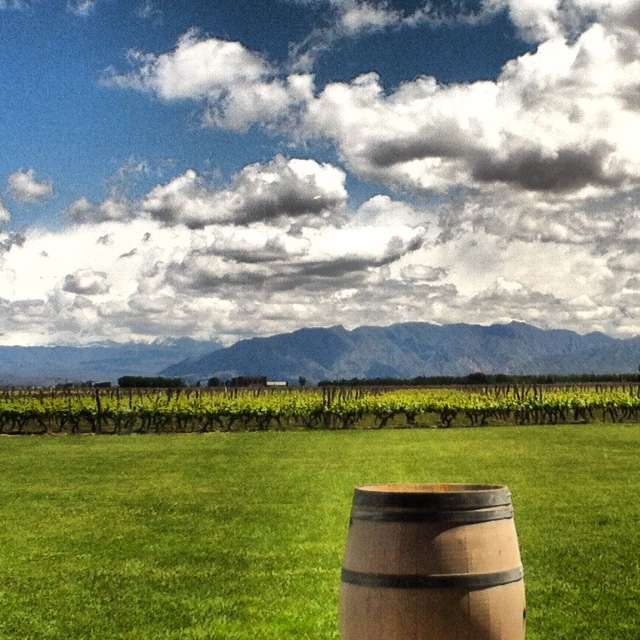 I can't stress to my readers enough how much I love Mendoza and that you should visit. If you love wine (and you don't have to be a connoisseur) this place should be a priority for you. 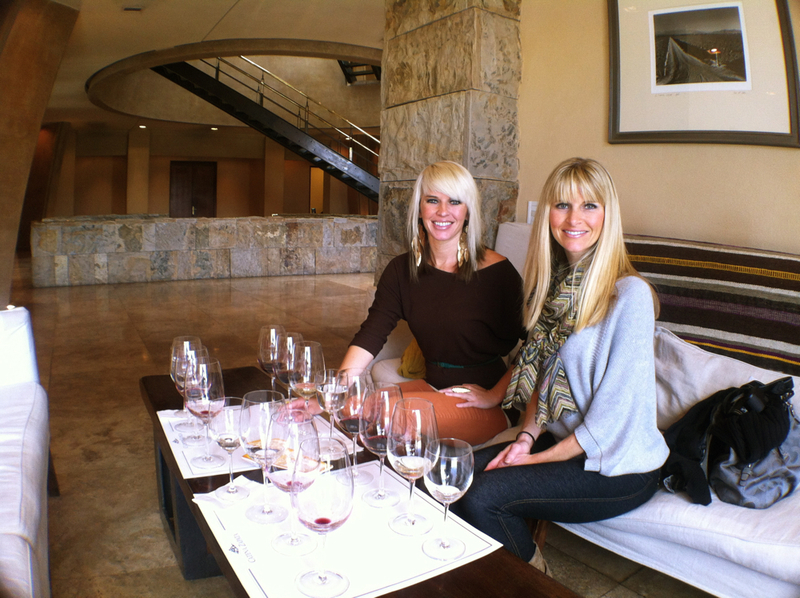 I have ranked it as my favorite place, over Napa and Tuscany, when it comes to pure wine indulgence. 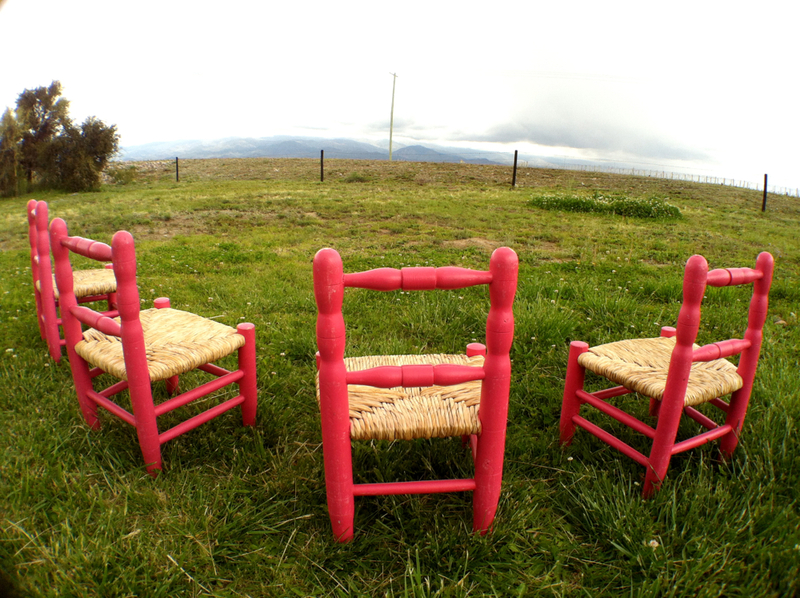 I believe it is the combination of value and style, with the Andes Mountains as your backdrop. I literally lived like a queen for three days. 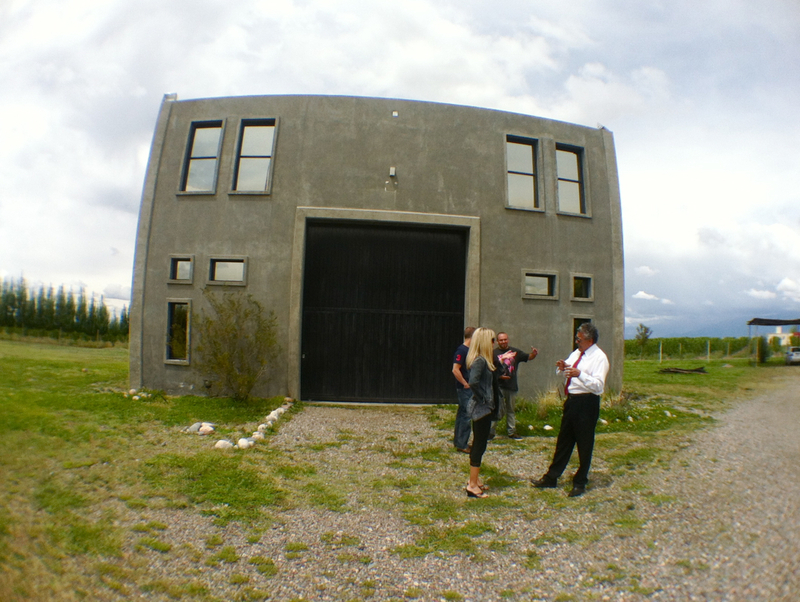 I truly believe within the next ten years, Mendoza will receive an influx of tourism and the once affordable prices will be a thing of the past. I am already dreaming of my return back to this beautiful part of the world, as it now holds a special place in my heart. Seriously, what are you waiting for? Please feel free to send me a message if you have questions about planning a trip there. I will be happy to point you in the right direction. 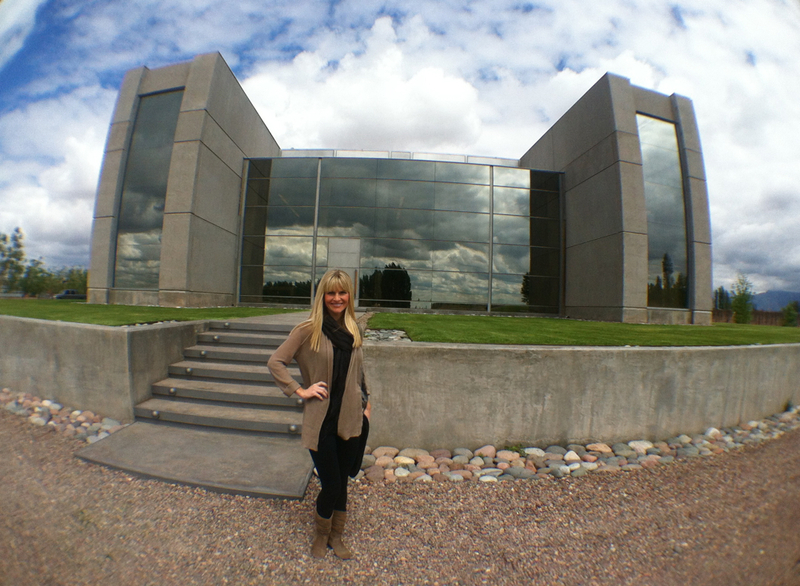 I have personally met with Condé Nast Travel Specialist Maita Barrenechea. 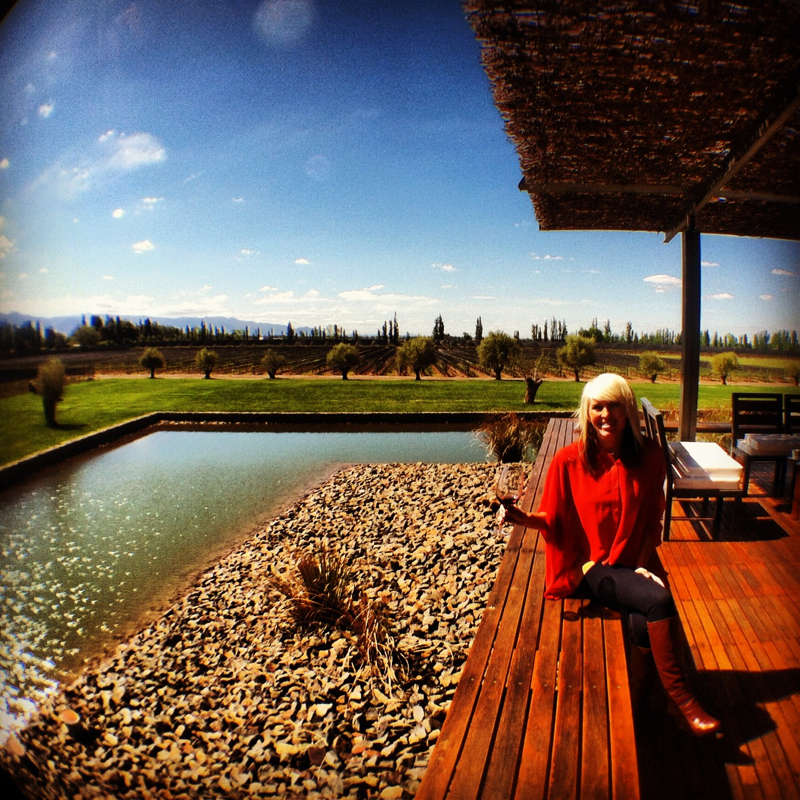 She, along with her travel company Mai10, can put together a once-in-a-lifetime Argentine experience if you're looking to splurge. Viewed 16791 times so far.